Happy Sunday! My swatch today is a patrotic offering from Julep, simply called America. There’s a part of me weirded out by shows of patrotism like this, especially between holidays, but it’s so glittery and flashy that I almost don’t care. 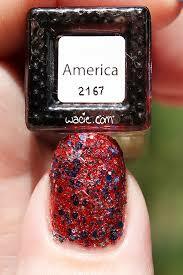 For the post today, I’m wearing three coats of America; the first six photos are taken without top coat. All photos were taken in direct sunlight outdoors. 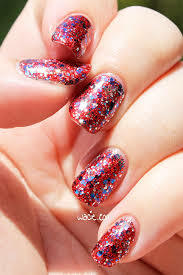 America is a clear-based glitter topper that consists mostly of fine red metallic glitter, but also contains larger blue and silver glitters and silver stars. Application wasn’t bad; the product consistency was pretty thick, edging on goopy; three coats of goopy polish isn’t fun for anybody. After it dried, which was about five minutes after each coat, it left a finely-textured crust of glitter. I did add two coats of Rica‘s Glossy Glam to smooth it out, which looked fantastic, but added yet another thick layer of stuff to my nails. The tips shrank up right away. 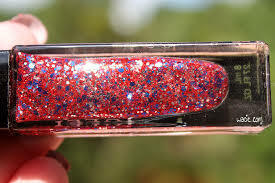 Patriotic or not, this is a gorgeous polish. The red glitters shine like ruby slippers, and the blues and silver stars are bonus. In fact, it’s entirely possible I bought this just because it has star glitter in it. 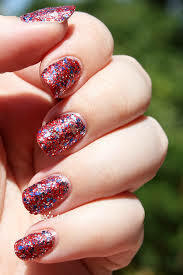 With or without top coat, this polish is very shiny, especially in sunlight. It’s just a ton of fun to wear. The following photos were taken with top coat. America may be discontinued by Julep, as it’s out of stock on their website. Swatch Saturday!! Today’s post is late because I make bad choices (and I have really good parties). The polish I’m wearing today is Tact is Just Saying Not True Stuff, I’ll Pass from Blue-Eyed Girl Lacquer; I’m wearing three coats with one coat of Rica‘s Glossy Glam top coat. Photos were taken in direct sunlight outdoors. 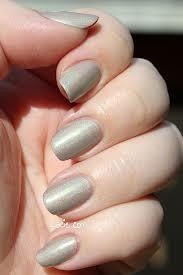 Tact is Just Saying Not True Stuff, I’ll Pass is a cool greige holo with a pearly green shimmer. Application was easy; the product consistency is smooth and easy to use. I had full coverage in two coats. I had no issues with flooded cuticles or goopy polish. 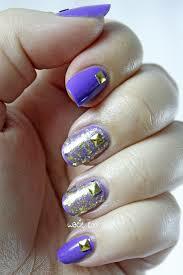 The polish dried quickly, about five minutes until it was dry to the touch, and it dried with a satin/matte finish. The holo effect is subtle but still bright. Top coat really helps make it shine. Tact, as I’ll call it, is one of the more subdued polishes from the Once More With Feeling Collection. The companion polishes are made with brighter colors, stronger holos, and more intense shimmers and flashes, but that doesn’t mean Tact isn’t incomplete. It’s actually pretty refreshing. The color is neutral and work-friendly, but the holo effect and green flash make this polish pretty, fun, and unique. Tact and the rest of the Once More With Feeling Collection are currently available from the Blue-Eyed Girl Lacquer shop. Welcome back, reader! It’s Monday again, and I have another mani. I’m pretty fond of this one; it looks like I put some actual effort into it. I mean, I did; it took me a long time to glue these studs on. I’m wearing two coats of Color Club’s Pucci-licious, two coats of Deborah Lippmann’s Boom Boom Pow, and one coat of Rica‘s Glossy Glam top coat. I always end up putting purple and yellow together. I am quite the fan of complementary color combinations, but purple and yellow might be my favorite one. Purple is such a bold and stately color, and adding gold to it just makes it even more luxurious and even more beautiful. I can’t tell you how I pleased I am with myself and my manicure right now. Pucci-licious is fantastically creamy, so I knew it could stand up on its own. 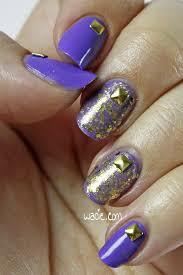 Boom Boom Pow, however, wasn’t the glitter beast I anticipated, so I put on a second coat and added the studs. I think the studs really make this look; it ties in the gold on the accent nails, which was kind of incongruous to the rest of the mani. The studs add much-needed balance and squares off the look. Get it, because the studs are square. I got my Pucci-licious from an outlet store. The Deborah Lippmann is from Sephora. The studs are by The New Black, which I purchased from Ulta.